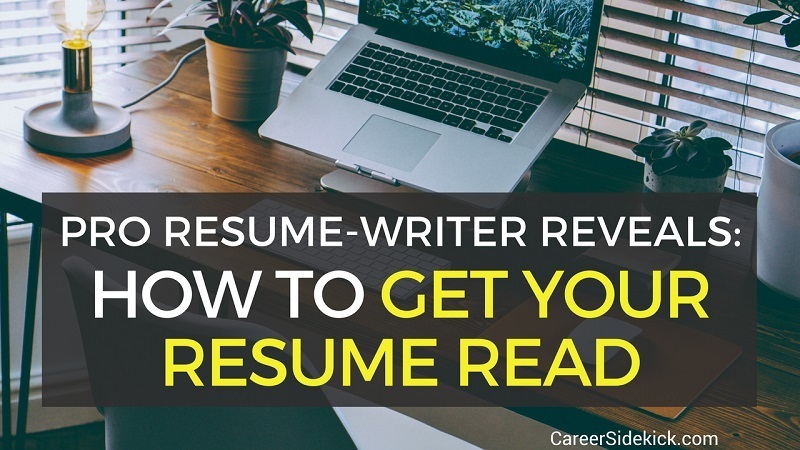 If you’re looking for how to get your resume read by hiring managers and recruiters, then you’ve come to the right place. When most people think of how technology has changed job searching, they think of applying online and Applicant Tracking Systems (ATS). While there is no doubt that technology has transformed the job application and screening process, from my viewpoint as a resume writer, the greatest impact is in how technology changed the way people read. So in this article, I’m going to cover specific steps you can take to get your resume noticed in today’s job market, so you can get more interviews and find a better job. Many articles on job search and resume writing reference a Ladders’ 2014 study showing that gatekeepers spend 6 seconds on that initial skim read. What this study didn’t consider, however, is that today most reading takes place on some sort of a screen – be it a desktop, laptop or mobile device. Print reads usually tend to take place later in the interview process. Screen reading is tough on the eyes because we digest information quite differently online than in print, especially when we are in a rush. Documents written for online reads still look great in print – but the reverse is not always true. By considering the 2 ways in which people read information differently in print versus online, it’s possible to facilitate a skim read of any document on any device – be it a 5-inch smartphone or a 20-inch monitor. #1 We can’t easily skim large, dense blocks of test online. Dense text can be a 6-line paragraph or 6 one-line bullets all crammed together. This challenge grows increasingly tougher as the screen sizes grow smaller. #2 We don’t scan from left to right smoothly online. In fact, we tend to start left and then jump around depending on what captures our attention. White Space: Replace 4+ line paragraphs with smaller paragraphs or bullets 2-3 lines in length. Be sure to insert at least half an inch of white space by entering the space key or playing with spacing to ensure there is a sizable break between every line and/or paragraph. This white space makes it easier on the eye to skim and absorb pertinent material – especially on smaller mobile device reading. Front Load: When crafting each achievement on your resume, make sure that the most powerful or impactful part of the statement appears at the beginning, or left side of the sentence, where the reader is likely to start if not finish. In addition to front loading, keep the sentence lean by skipping adjectives and qualifiers and replacing them with data and figures that spell out your achievement within the content. NEW BULLET: “Saved client $20M by leading an ERP implementation that replaced company’s legacy system. #1 Headline: Just like a headline from a magazine or newspaper article, a headline on your resume clues the reader into what your story is about, by telling them the types of roles for which you are well-suited. #2 Summary: Skip the 20th-century era objective statement and the early 21st-century summary paragraph laced with adjectives to describe you. Because so many people describe themselves using the same adjectives, they have lost their value and have become diluted. Replace the same old adjectives with details about your unique career story, and weave in language that aligns with what has been asked for in job descriptions. Because of rapidly-changing technology, resume reading has become more rushed than ever and takes place on screens rather than in print – at least in the early stages of the interview process. As a result, if something is hard to read and someone is in a rush, it’s likely the reader will skip it altogether. So if you want to get your resume read and noticed, you need to account for this. By formatting your resume so that it’s easy to read on screens of all sizes, you increase the chances it will get read carefully and get you an invitation to interview.